Having received several brilliant excuses for remaining in bed…..the dog ate my cycling shorts….I’ve lost my bike…i ve got a bone in my body……I m running the Grand National and the Marathon…..I m in a rescue boat at the boat race……i ve got to cycle the tour of Flanders….i didn’t think there would be many takers for a short ride. 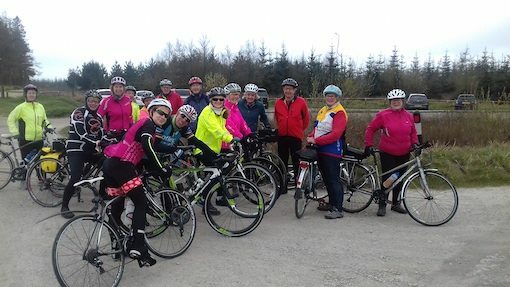 Fifteen riders, however, wanted a short ride, despite the drizzle as we arrived at Hornbeam. So they made their ways speedily up to Little Almscliff and kindly waited for the straggler. They continued to the first left on Penny Pot Lane, and waited. They sped through Kettlesing and Tang taking a much easier turn than I knew towards Clint Bank. They stormed on to Sophie s and waited, discussing the lack of seats and what to do next. 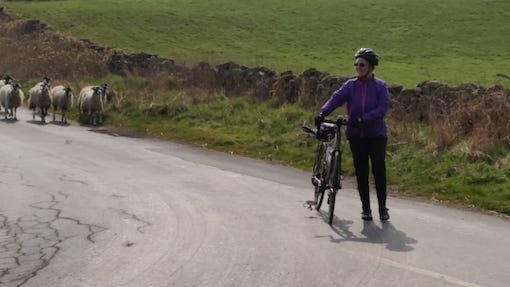 Luckily Jean and Bridget stepped in to decide on a coffee stop, as at this point I gave up leading from the back and headed home to win the Tour of Flanders, following Dennis, Peter and Sue T up out of Hampsthwaite back to Killinghall and Harrogate. 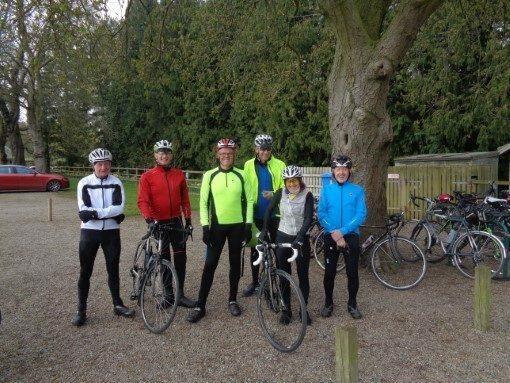 13 riders set ” briskly” departed Hornbeam on a rather grey day, led by Helen. 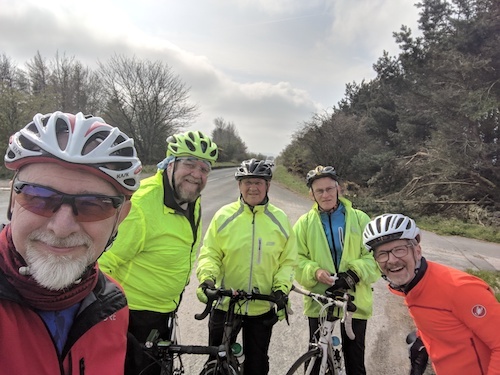 Following the prescribed route on flat, quiet roads we were able to chat and enjoy the scenery. In Masham, where a market and an event was taking place, both cafes were jammed, so we opted for the brewery visitor centre , which was also incredibly busy. To keep life simple, most people opted for cheese scones, to be then told that there were only 4 available so we were offered toasted tea cake as an inferior alternative. 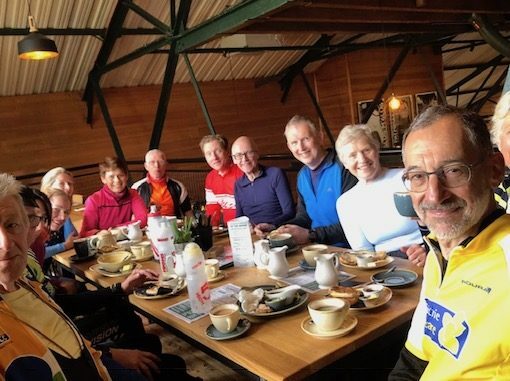 We ended up spending an hour at the visitor centre during which time they could have made more scones! It took them 45 minutes to bring out the 4 they had !! 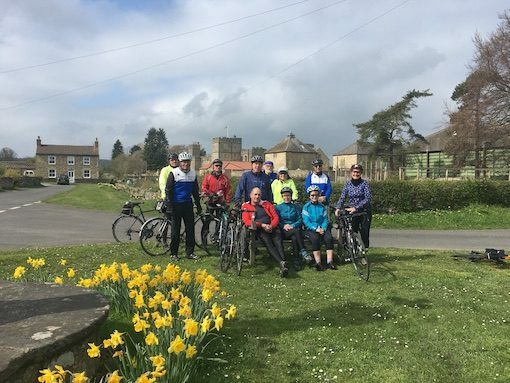 On leaving the cafe, we elected to take the direct route to Grewelthorpe, then passed through Ripon to Bishop Monkton where we shed 2 riders who carried on straight back to Knaresborough whilst the rest of us headed through Markington to the Drovers crossroads and back to Harrogate via the greenway. The grey day got better and the sun even put in an appearance after lunch. Lovely scenery and great company. 60 miles. Julie E.